Lower back pain is one of the common problems faced these days. Nearly 80% of the adults are face at some point in their life. Pain starts with mild constant pain in the area below ribcage, the area known as lumbar. This pain intensifies slowly to sudden sharp pain. This is the leading cause for disabilities that are related to jobs and missed job. When pain lasts from less than 6 weeks, it is classified as acute. When the pain lasts for 6 to 12 weeks it is classified as semi-chronic. When pain lasts for more than 12 weeks it is classifies as chronic lower back pain. In most of the cases, lower back pain heals on its own. But, when it does not heal on its own, there are many effective treatment options to go for. 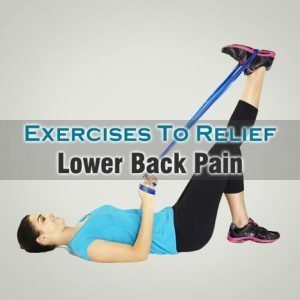 Lower back pain relief exercises are also one of the effective treatment options to choose from. This is simple stretching exercise, which helps in lower back pain relief. For doing this firstly lie down on your back on exercise mat or on floor. Keep a book or a small flat cushion. Now spread your arms sideways perpendicular to your body. Next keeping your legs together and bend your knees. Relax your body and keep your chin up. Now keeping your shoulders on floor slowly roll your bend knees to your right side until your leg touches the floor. Your pelvic region should also follow the roll. Take a deep breath and hold in that position for couple of seconds and move back to previous position. Repeat the same on left side. Repeat the rolling alternatively for 8 to 10 times. Hamstring stretch also helps in relieving lower back pain effectively. For doing this, you need to like down on back on floor. You will need a small towel or band. Now bend your left knee and keep your right leg straight. Hold the right leg by looping the small towel over the foot. Now keeping your right leg straight pull the towel back such that your leg rises. Raise your leg until it is perpendicular to your tummy. Feel the stretch and hold your leg in that position for 15 to 30 seconds. Move back to previous position. Repeat the process with other leg. Repeat the whole process with alternate legs for about 2 to 3 times. Piriformis stretch is one best lower back pain relief exercises to do. For doing this, you need to lie on your back. Keep a book, or small flat cushion under your head. Now bend your knees keeping your feet flat. This is your starting position. Now cross your right leg on and rest it on your left leg such that right ankle rests on your left knee. Grab your right knee and slowly move towards your left shoulder until you feel stretch in buttocks and hips. Take a deep breath and hold in that position for 15 to 20 seconds. Move back to starting position, relax a bit, and repeat the process with other leg. Repeat the whole process with alternate legs for 2 to 4 times.